The team at Brewham Lodge has been very busy so far this month. Two new incomers mean that the Sanctuary is full for Christmas. Graham writes: “What does the future hold for this fine looking fellow? 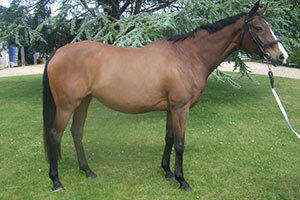 Fafa is a 6-year old bay gelding by Westerner out of Kayf Tara mare Ifuseeherseayhallo. Fafa was trained by Tommy and Laura Gretton at Middle Bouts Farm near Inkberrow in Worcestershire for owner and amateur jockey David Dunsden. 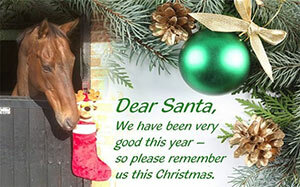 Most unfortunately Fafa suffered a pelvis injury, which brought a premature end to his racing career. 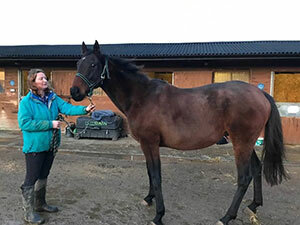 The Grettons were patient and set him on the road to recovery, before sending him to the Peter O’Sullevan High Dependency Unit of The Racehorse Sanctuary.” The team at Brewham Lodge will take more time to effect Fafa’s full recovery before determining what he enjoys best and finding him a new career and a forever home. Thoroughbreds are remarkably versatile athletes, so having been amazed by the dressage at Olympia this week and transfixed by the puissance, it is fascinating to wonder where Fafa may yet make his mark. Graham reports: “Secret Jewel or Sweet Pea as we call her has left Tricklewood Stables in West Sussex and is now resident at Brewham Lodge Stables in Somerset. For a sophisticated lady who hates travelling Sweet Pea loaded into the lorry and stood munching her hay net all the way, on arrival she strolled into her new stable, had a roll on her lovely straw bed and behaved as though she had been there all of her life. 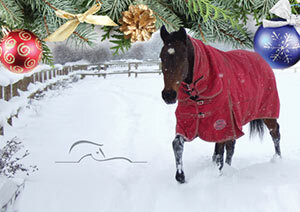 We are all very proud of this lovely 17-y-o mare who will now live out her days at the Sanctuary. Our Fontwell Park Charity Raceday is set for Sunday 25 February 2018. Your Fontwell Committee has plans for our raceday on Sunday 25 February, National Spirit Hurdle Day, well in hand.